Teresa Stratas was one of the controversial stars of the latter half of the twentieth century, and one whose personality and life, like that of Callas, another great soprano of Greek descent, are inextricably linked with her performances in the minds of many members of the public. Also like Callas, she had a special magnetism as a performer, due to her dramatic intensity and exceptional physical beauty. Her top range became weak during her middle and late career and she lost some focus in the middle of her voice, which sometimes caused her to force. However, her performances on stage and on film were so riveting that most were willing to forgive those vocal flaws, and even her habit of canceling, usually due to nerves. She grew up in Toronto and began singing in nightclubs and in her father's restaurant when she was 12. Encouraged by her successes, including radio performances, and after being given a free ticket to La Traviata, an experience which she said overwhelmed her with the concept of what the human voice can do, she auditioned for the Opera School at the Royal College of Music in Toronto in 1954. She had never studied voice, knew opera only from that one performance, and brought Smoke Gets in Your Eyes as her audition piece, but her personality and potential talent were so impressive that she was admitted, and was such a quick learner that she made her debut with the Canadian Opera as Mimì in 1958, and won the Metropolitan Opera Auditions of the Air the next year, making her debut as Pousette in Manon the next year. In 1960, she created the title role of Glanville-Hicks' Nausicaa at the Athens Festival. Her Covent Garden debut was again as Mimì in 1961, and in 1962, she made her La Scala debut as Isabella in de Falla's Atlantida. In 1974, she came to international fame with her appearance as Salome on a television production of Salome, considered one of the very few singers in living memory who could convincingly portray Salome's transformation from naive teenager to depraved woman. In 1979, she sang the title role of the first performance of the three-act version of Berg's Lulu at the Paris Opera. In the 1980s, she almost completely withdrew from the operatic stage, though she made notable recordings of Weill songs, and appeared in films of La Traviata and Amahl and the Night Visitors. She also explored Broadway, earning a Tony nomination for best actress for her performance in Rags in 1986, and recording Julie in Showboat. In 1981, she backpacked through India, where among other activities, she volunteered for Mother Teresa's projects in the poorest areas of the cities. In 1988, she returned to the Met to create the role of Marie Antoinette in Corigliano's The Ghosts of Versailles. 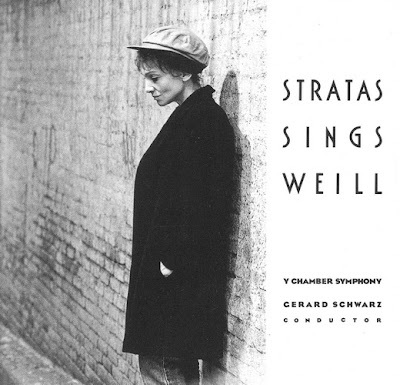 Revealing an affinity for Weill, Teresa Stratas fulfills her promise to Lotte Lenya on her deathbed to "carry on the torch for Kurt Weill's music." Stratas's glorious soprano has never sounded better as she applies her operatic expertise to deliciously caress this music without losing any of the underlying subtext. Lacking the grittiness of other interpreters, she captures the emotional angles by letting her beautiful voice express the tortured heart beneath it; where others shout at you, Stratas sings at you. She casually bounces off the cheerier selections from One Touch of Venus and Happy End, letting Gerard Schwarz's brilliantly conducted orchestra display their wit. Program notes include a fascinating interview with Stratas.